The Dojo , (Place of the Way), is a beautiful and vibrant home for a community of diverse, adventurous and exuberant people passionately practicing Aikido. Its purpose is to teach the practice of Aikido to adults, teens and kids in alignment with the teachings of the founder, Ueshiba Morihei O Sensei (1883 – 1969). 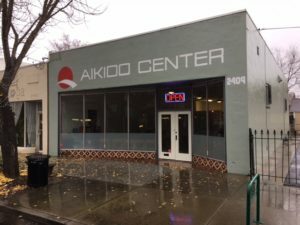 The Aikido Center dojo is located in Midtown Sacramento, on 21st Street between Broadway and X Streets. Upon entering the dojo one feels the sacred environment imbued with the spirit of Aikido. Aikido students of all ages are cultivating awareness and respect for themselves, their training partners, their Sensei and the dojo environment. Aikido focuses on the development of one’s character, which is reflected in the very way a person acts in the dojo. While practicing Aikido students keep in mind that the dojo and specifically the feeling of the dojo is enhanced or diminished by the actions and attitudes of its members and its senseis. By cultivating respect and appreciation while practicing in the dojo, great steps are being made to integrate Aikido principles in one’s life. Our dojo history starts January of 1995 in a small space between Bears Books and Esoteric Records across from the Capital Park on L Street. The Aikido Center embarked on its journey to bring the art of peace to the capital city with little more than a couple months paid rent, eight 5×10 training mats, a phone, an answering machine and a futon for its founder and steward Matt Fluty Sensei to sleep on. The Aikido Center was humble in worldly possessions but abundant in spirit and purpose. Within ten months its community of devoted practitioners had grown to 40 full time training students and two Senseis with the welcoming of Matt Sensei’s partner Theresa. From November of 1995 through September of 1996 The Aikido Center resided in a classroom at Sierra Two Center and a warehouse off of Highway 99 and 44th Avenue. Longtime students refer to the warehouse location as “Hell Dojo” for often it was cooler outside in the 100+-degree weather than inside. This period of time was much like the forging of a sword for its community and its Senseis. “Our commitment to this path was tested,” says Matt Sensei. In November of 2016 The Aikido Center moved into its current location at 2409 21st Street. With the generous practical aid of its community, a beautiful dojo (place of the way) set down roots. We welcome you to visit and experience the dojo.